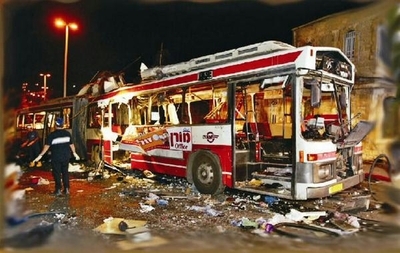 Twenty-three passengers were murdered when a powerful bomb tore apart a crowded bus in the heart of Tel Aviv on Oct. 19, 1994. More Israelis were killed by Palestinian terrorists in the 24 months following the signing of the Oslo Accords than in any similar period in Israel's history  and far worse was to come. Amid the emotional public backlash that followed Rabin's assassination, any repudiation of Oslo would have been deemed a victory for his assassin. So even though the Labor Party was defeated in the 1996 election, the new Likud prime minister  a young Benjamin Netanyahu  could claim no mandate to annul the accords. The Oslo process continued. Follow-up agreements were negotiated and signed. But fresh concessions from Israel only encouraged fresh violence from the Palestinians. Ten years after Rabin's death, the "land-for-peace" mindset reached its apotheosis with Israel's unilateral retreat from the entire Gaza Strip. Result: a takeover of Gaza by Hamas, more than 16,000 rockets and mortars fired at Israeli civilians, and torrents of lurid propaganda that extol the spilling of Jewish blood.